This is the story of three girls who went to Atlantic City expecting to be blown away by a very famous restaurant, and were instead utterly wooed by a casino floor noodle bar. It is a harrowing tale, of spicy intrigue, unforeseen blandness, and no small amount of gluttony. Big Hungries Jill and Melinda were the two other ladies, and we were in the shore city for the Miss America Pageant, which was back in its hometown for the first time in nearly a decade. 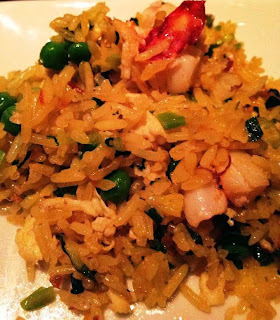 We also were in town to celebrate my birthday, and since I knew Top Cheftestants Dale and Angelo had both been Buddakanites in NYC prior to their turns before Padma and the panel, I figured the meal would be top notch. Plus, there was a giant Buddha. I love a giant Buddha. Undoubtedly, it is lovely inside AC’s Buddakan. And the drinks were good. While our overall meal was not a home run, I’ll tell you the dishes we did like, because whether we were impressed or not, this is one of the hot spots on the Boardwalk, and if you’re traveling to AC anytime soon, I’m betting your group is going to want to eat here. We began our meal with the sashimi, which was hamachi, and which was excellent. The citrusy soy wasn’t earth-shattering, but was tasty, and the “sizzling oil,” while not sizzling in any identifiable way, was herby and very nice with the clean-tasty, firm fish. The shrimp bao were another hit with the table. The shrimp were sweet and clean, and a slow heat crept up on the palate as you made your way through the tender, steamed bao. 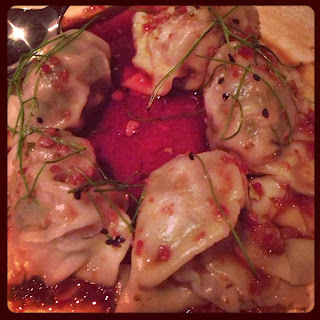 We also invited spice to the table by ordering the Szechuan pork dumplings, but these were only OK. Not that spicy, and not that porky. The skin of the dumplings was very fragile and slippery as well, with none of the pleasing crisp you get when they’re pan fried. The rest of the meal, a haze of small plates ranging from a very bland lobster fried rice, OK but not outstanding sui mai, a decent shrimp lo mein with savory, tiny mushrooms but not a lot else going on, and an overly salty vegetable tempura came to our table, but we just were not blown away. Not considering the alleged pedigree of the New York and Philadelphia brothers to this restaurant. I refuse to believe either Dale or Angelo from Top Chef would be OK with these ordinary dishes, nor that they would have even made it to the show had the food been of this caliber when they were both cooking for the organization. In any event, this was not the spectacular birthday meal for which I had hoped. We had a good time, of course, but our after dinner cocktails at Village Whiskey at Revel were crafted with far more care than any of the dishes we tasted at Buddakan. The next morning, we three spent a few ultra-luxurious hours in the Bask Spa, also at the Revel Resort. I’ve found myself many times since wishing I was back in the spa’s cool, glowing salt chamber, breathing easy and lounging in a cushy robe. The spa is pricey, and worth every blessed cent. From the mineral pool to the steam rooms and sauna, hot tubs, and posh relaxation rooms – this is the most peaceful place in Atlantic City, to be sure, and a welcome respite from the bustle of the Boardwalk. After all that luxuriant soothing, we were peckish, though, and wanting something cheap and quick before running back to our comparatively spartan room at Bally’s to prep for that night’s pageant. My eyes spied Yuboka, a tiny noodle bar right on the casino floor. 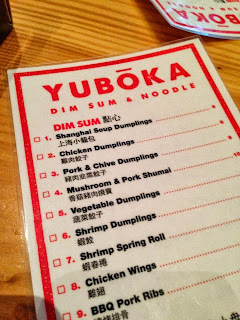 But alas, Yuboka is chef Jose Garces’ version of a humble noodle bar, and oh, it’s a splendid vision. For about $25, this simple, quick meal far surpassed our experience at Buddakan the night before. 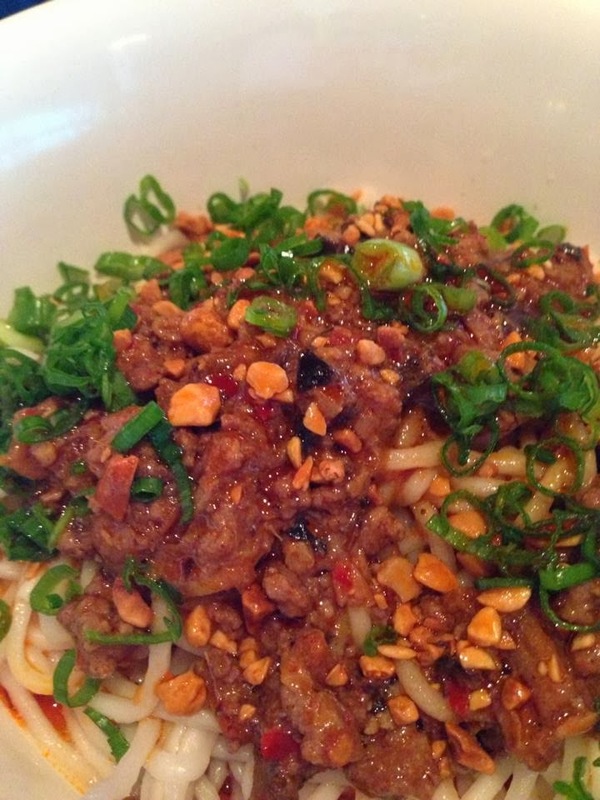 Melinda had the Dan Dan Noodles, in a chile oil-based sauce, deep and earthy with zha cai, a pickled Chinese vegetable, and ground pork. The rich sauce was a slow-burning pleasure, it’s heat building through compounding bites, and the noodles were silky and had just enough chew. 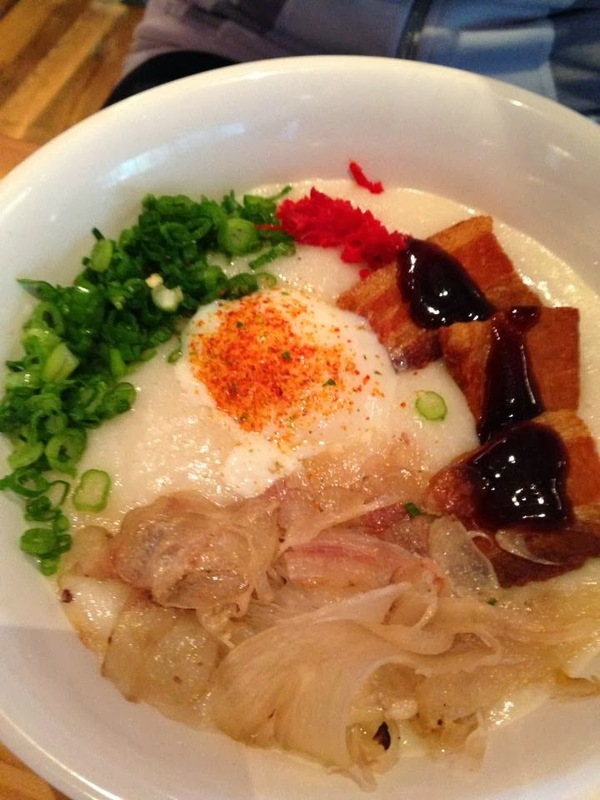 Jill fell madly in love with the congee she ordered. I’d never had this dish before, only seeing it made on Top Chef (there that is again!). It’s basically grits, though, or some grain cooked into a porridge-like consistency. This was topped with pork belly, beef tendon, egg, and hoisin sauce. I avoided the tendon, because personally, that is not a texture I care to sample, but the egg/pork/congee medley created a very breakfast-like taste, and it was pretty great. I suspect Jill has been researching recipes to make this herself at home, and I don’t blame her. 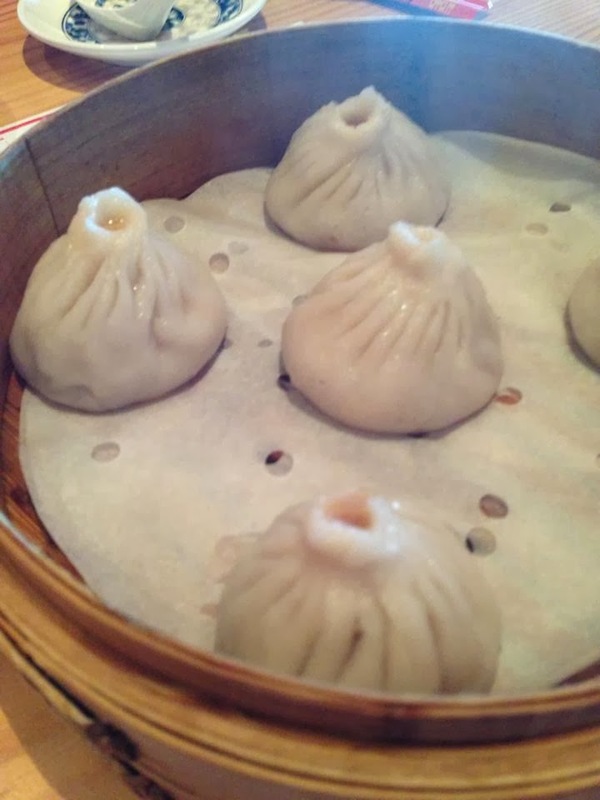 I went for the soup dumplings, and was rewarded with my first ever TRUE example of this gastronomic feat. If you’ve not watched every Asian episode of No Reservations, and haven’t visited the dim sum palaces of Chinatown, you might not have heard of these wonders. Unlike potstickers, or meat-filled dumplings, these are filled with broth that’s been chilled down. If you’ve ever made stock or broth from bones, you’ve seen the effect that refrigerating the final product has on the liquid – the gelatin that steeps into the stock from the bones becomes jelly-like when chilled. This is how the dumpling-makers get the broth into the little soup pockets – when it’s chilled jello. Then, when the packets are steamed, the gelatin dissolves, and you have soup inside a dumpling. It’s a work of scrumptious genius, and the broth in question at Yuboka is rich, complex, and ultimately comforting. I loved them. 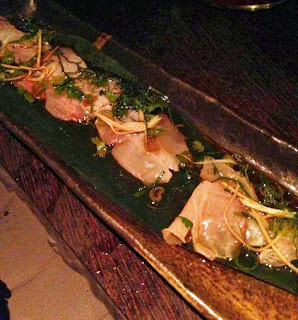 And so it was that a quick lunch at Yuboka outshone our big celebratory dinner at Buddakan. 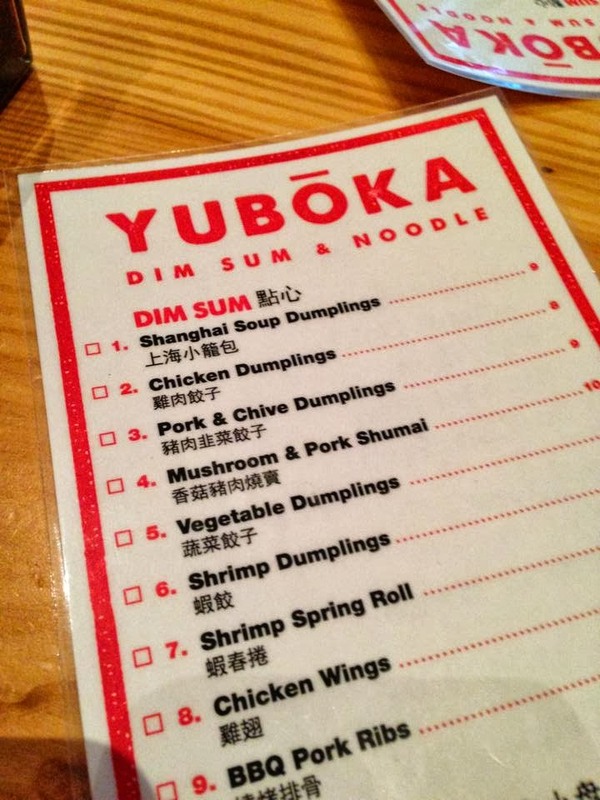 I would give Buddakan a five on the BHS scale, while I would award Yuboka an eight. It’s that simple. I will not be fooled by a gigantic golden Buddha, Big Hungries! Now, check back next week, because we had one more meal at Revel, and it was a doozy you’re going to want to read about. 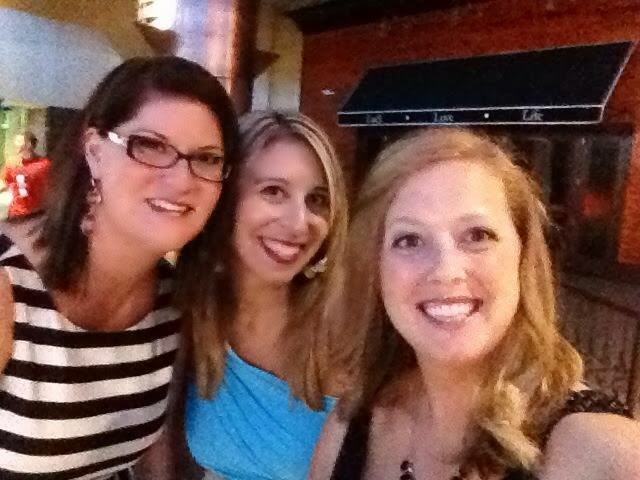 I’ll leave you with a fetching shot of my best ladies and me, mixing it up in the AC. My hunger is big; my personality is bigger! The original Buddakan is definitely superior to AC's version. I'm sorry you had a bad meal there, I love the huge golden Buddah! Yukoba looks great.